Cream: An emulsion, semisolid dosage form, usually containing >20% water and volatiles and/or <50% hydrocarbons, waxes, or polyols as the vehicle, that is generally for external application to the skin or mucous membranes. Gel: A semisolid dosage form that contains a gelling agent to provide stiffness to a solution or a colloidal dispersion. A gel may contain suspended particles. Lotion: An emulsion liquid dosage form. This dosage form is generally for external application to the skin. 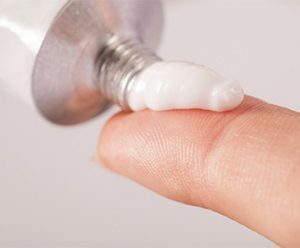 Ointment: A semisolid dosage form, usually containing <20% water and volatiles and >50% hydrocarbons, waxes, or polyols as the vehicle, that is generally for external application to the skin or mucous membranes. Paste: A semisolid dosage form, containing a large proportion (20 – 50%) of solids finely dispersed in a fatty vehicle, that is generally for external application to the skin or mucous membranes. Foam: An emulsion containing a dispersed phase of gas bubbles in a liquid continuous phase containing the API. Medicated foams are packaged in pressurized containers or special dispensing devices and are intended for application to the skin or mucous membranes. The medicated foam is formed at the time of application. Surfactants are used to ensure the dispersion of the gas and the liquid phase. Global regulators address both topical and oral dosage forms similarly, differentiating between solid and liquid drug products.Table 1 of the FDA’s 1999 Container Closure Guidance assigns topical powders to the same class as oral tablets and capsules, concluding that there is a low level of concern for packaging interactions, based on a medium likelihood that a packaging-dosage form interaction could occur and the lowest degree of concern associated with the route of administration. This low risk classification is reaffirmed in USP <1664>, with topical (and oral) powders “moving down a notch” in terms of risk due to a lower estimate of the likelihood of a packaging-dosage form interaction. Given this classification, Table 2 of the FDA Guidance notes that minimal chemical or biological testing is required and that an appropriate reference to the indirect food additive regulations is sufficient. Similarly, the Immediate Packaging Guidelines of the European Medicines Agency (EMEA) establish that packaging systems for solid topical (and oral) dosage forms (and their materials of construction) require minimal testing [that the packaging system be fully described (general information) and that it meet relevant compendial specifications] to establish their safe use. Liquid topicals, specifically solutions and suspensions, are classified as having a moderate level of concern for packaging interactions, based on the high likelihood that a packaging-dosage form interaction could occur and the lowest degree of concern associated with the route of administration. Given this classification, Table 2 of the FDA Guidance notes that minimal chemical or biological testing is required and that typically an appropriate reference to the indirect food additive regulations is sufficient if the liquid topical is aqueous-based. If, however, the drug product contains co-solvents (or is expected to extract greater amounts of substances than water), then additional extractables information may be needed. Alternatively, the Immediate Packaging Guidelines of the European Medicines Agency (EMEA) establish that packaging systems for liquid topicals (and their materials of construction) could require extensive testing, including extraction studies, migration studies, and toxicological assessment, to establish their safe use. Lastly, appropriate testing for the selection and qualification of packaging materials and systems, applicable to topical dosage forms, is described in various mandatory USP chapters including <660> (glass), <661.1> and <661.2> (polymers), and <381> (elastomers). As was noted for other solid dosage forms, solid topicals can act as a viable “sink” for packaging derived leachables (and environmental impurities), typically via the process of sorption (as opposed to the “active leaching” that occurs for a liquid drug product). Thus, leachables profiling of a solid topical drug product is a relevant part of its safety assessment. Although they are classified similarly by regulators, liquid topical and oral dosage forms can differ greatly compositionally and thus they present different challenges from an extractables and leachables perspective. Based on composition, one anticipates that the major classes of topicals (creams, ointments, and lotions) would have a greater “leaching power” than the major classes of liquid orals (solutions, suspensions, emulsions); thus, in general and all other variables being equal, liquid topicals would contain a greater number of leachables at higher levels than would a liquid oral. More significantly, however, liquid topicals would generally present a greater analytical challenge than would liquid orals, specifically with respect to the ability to screen the drug product for leachables at relevant reporting thresholds such as the AET. Thus, one would anticipate that extractables studies in general, and simulation studies in particular, would have greater applicability, liquid topicals versus liquid orals, which presents its own challenge in terms of establishing and justifying proper simulating solvents for the liquid topicals. Performing successful and practical extractables and leachables assessments for topical dosage forms requires excellence in strategic planning (for example, establishing the proper use of extraction or leaching studies), expertise in study design (for example, establishing and justifying the proper simulating solvent), skill in study execution, especially in analytical testing, and a profound understanding of materials, extractables and leachables, gained through extensive experience. With our vast experience, Nelson Labs Europe has developed a broad expertise in designing and implementing chemical testing programs which leverage state-of-the-art analytical techniques, highly trained and competent analytical scientists, and knowledgeable study directors. Nelson Labs Europe has a long history of successfully partnering with drug product and packaging manufacturers and vendors using topical forms to effectively and efficiently secure regulatory approval for their products. To find out more about our Topical Dosage Forms Packaging test services and programs, please feel free to contact us at infoEurope@nelsonlabs.com or call us at +32 (0)16 400.484.